If you live in Durban, and you've never been to the i heart market, then you are missing out! The first market for 2012 kicks off tomorrow at Moses Mabhida Stadium, from 9am to 2pm. The i heart market is full of beautifully hand crafted and homemade goodies, that are locally designed, with a contemporary edge. If this sounds like your scene, go down to the stadium to visit all the stalls... we are certain you won't leave empty handed! 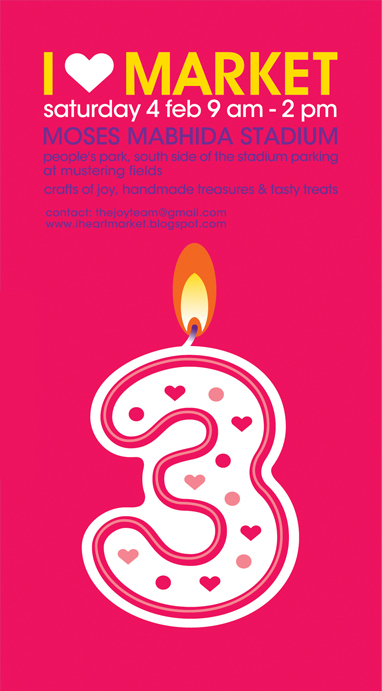 If you are interested in opening a stall at the market, you can email them at thejoyteam@gmail.com. Or if you're just a groupie, and want to know what they're up to, visit their blog here, or find them on facebook here.